Following up on my blog post from a few weeks ago, a couple of colleagues and I have published a formal response to the media frenzy covering the study that claimed a relationship between Facebook use and lower grades. Back when the story broke, most media outlets ran with the claims made in the original press release or even took it to a next step by suggesting a causal relationship between Facebook use and lower grades. Only a few outlets took care in reporting, among them the Chronicle of Higher Education. In the last few days, the BBC has had a piece considering the various perspectives. By the way, this is the quickest turn-around I’ve ever experienced with an academic publication. Below the fold is a bit more describing how it came about. 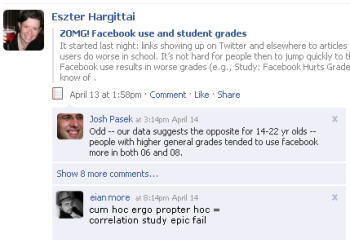 On Sunday, April 16th I went to bed realizing that a story would likely spread like crazy the next day as it claimed a negative relationship between Facebook use and academic achievement. I looked up what I could about it and was concerned as it didn’t seem like the study offered solid evidence of the claims, but it was precisely the time of piece the media love. Based on my UIC data set (representative sample of 1K+): no correlation b/w any Facebook use or # of hrs of SNS use & students’ grades, fyi. I would have preferred not to, mainly because it was the first day in a long time that I had a full day for my own work. But throughout the day, an increasing number of media outlets (first in the UK then in the US and elsewhere) picked up the story. Following all that media coverage were people’s tweets plus blog and Facebook posts about the study. Twenty minutes after posting on my Facebook Wall, Josh sent me an email asking whether I was interested in “working on a report” about all this. I said I’d be up for working on something more formal. Many thanks go to the editor of First Monday, Ed Valauskas, and the reviewers for recognizing that a quick turnaround here would be helpful. Regarding the image above, note that Josh’s comment is the authentic one with the original time stamp while eian’s is one we added later for the illustration. This entry was posted on Wednesday, May 6th, 2009 at 3:34 pm	and is filed under Blogging, IT/Comm, Research. You can follow any responses to this entry through the RSS 2.0 feed. Both comments and pings are currently closed. This is fascinating. So how much time passed between when your day got interrupted & when your paper was accepted? Thanks, Pablo. It took less than three weeks!